Yesterday was an okay day. I worked, I went to therapy, I played Dungeons and Dragons. Work was okay. Therapy was….therapeutic. Dungeons and Dragons? It was fabulous. Our kids are still figuring it out, but we’re having a blast. After we methodically gathered sick sorta-zombie-ish people and put them to bed, we interviewed one. He told us about a witch! Naturally, this ended with us ransacking her house, stealing flowers from her garden, and stealing potions. The labels on the potions were great. “Throw at front door Donkus” has to be my favorite, though. Oh, and my kids have matching wedding rings that are magical in some adorable way. Great times. 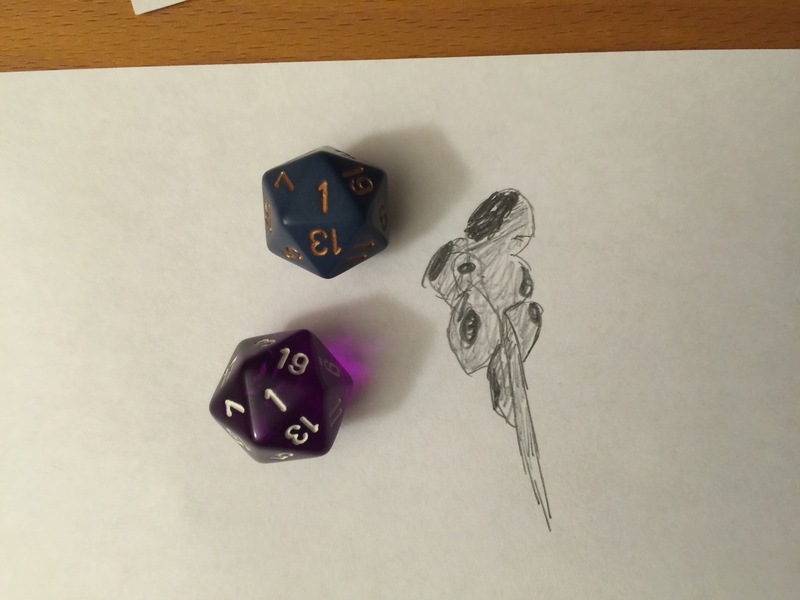 My daughter and I decided to do some D&D shenanigans, and rolled matching natural 1s. Now, a natural one is where your die reads “1”. You generally get no bonuses in such a situation, so it doesn’t matter if you are the Grand Hooplah of Acrobatics, a natural 1 means certain failure. We rolled two of the bastards. In the same action. We were super scared, but the DM was merciful. We didn’t die, or break anything. We just failed with flair. Fair enough. Tonight, these dice sit on the porch to contemplate their foul deeds. Maybe if they’re nice, we’ll use them again (with great trepidation).